Ask fellow campers about "Mohican State Park" and nearby attractions. This is a very family friendly campground with something to do in all seasons. Fun swimming in the summer, hiking in all seasons, bicycling most times...and the town is quaint and close by. We camped at Mohican State Park in a Motorhome. Downtown Loudonville is a must visit. Don't miss the 100 plus year old hardware....lots of camping stuff too. Our stay was great. The workers were very friendly. This was the second time this year we camped there and we went in as a first come first serve. They have several of them. When it was quiet time it was quiet. this is our first year with a travel trailer upgrading from a pop up. Campers were very friendly and when we needed help there was always someone that was right there to help. Will go back again when in the state. 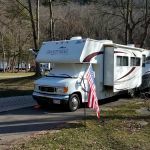 We camped at Mohican State Park in a Travel Trailer. There is a very nice pool, playground and a bike trail right on the property. There is also a small river that you can go tubing on. Just a small car ride or bicycle ride away there is more canoeing or zip line. There is an Amish grocery store very close or you can go into town just about 15 minutes away. There is not a lack of things to do. Just have to travel a short distance. It is a large state park. Very nice park with lots of grassy areas for activities or just for kids to play. Large pool that was clean and well used. Hiking trails and located on a river. Hand dipped ice cream is available in the camp store. Staff were very nice. We camped at Mohican State Park in a Travel Trailer. It appears the area is very popular for river kayaking. Was a over-nite stop for us so didn't look around much. Site 133 - full hookup. This site is on the end of the road and is actually a pull thru. Good size pad and roomy. Good water pressure and steady 50 amp service. Campground is beautiful with river access close by. Large clean swimming pool. 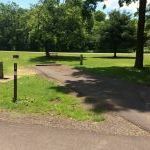 We camped at Mohican State Park in a Fifth Wheel. Bring an inner tube and some water shoes and enjoy the cool slow moving waters of the Mohican River. We love Mohican. The sites are spacious and the ones on the creek are very relaxing. Plenty to do for young and old. Some of the best hiking and Mountain bike trails around. Very pretty and quiet park. We camped at Mohican State Park in a Travel Trailer. All in all it was OK. I enjoyed the hiking on lots of trails--VERY GOOD. We camped at Mohican State Park in a Travel Trailer. Our assigned spot was directly next to a construction site but they moved us to a pretty spot on the water. The site was fairly level and the river is scenic. 50 amp service but no water at our site; they have other sites with full hook ups. Staff very friendly. It probably gets busy in the summer but in April only 20% full. It rained heavily our last day so the non-gravel areas of the camp site were boggy but the RV site itself was gravel and the roads are paved and so not a problem. Excellent hiking trails. We camped at Mohican State Park in a Motorhome. The small museum in Loudonville was an unexpected gem. Very interesting. Takes about an hour. This is a very nice campground. Our site was waterfront. The sites are level and required no blocking for leveling. The campground was not busy during our stay. (6 other campers). There was no OTA TV service or cell phone service, which was fine with me. Located near Amish area so there was lots of places to shop and eat. We camped at Mohican State Park in a Travel Trailer. Site was very nice, easy to get into and pretty level. Water and sewage connect easy to 5th wheel, electric also good. Neighbors were friendly. Walnut tree was dropping walnuts on our site. Put a hole in our awning, bombarded on top of 5th wheel, people walking on road had to duck out of there way, shoulder black & blue from walnut hitting hubby. Couldn't get another site, was told they were full. Site would of been nicer if they would do something about that walnut tree! 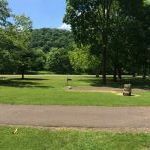 We camped at Mohican State Park in a Fifth Wheel. Stayed for two nights. I didn't use the showers or laundry, but the bathrooms were clean. I liked how big the sites were. We stayed in site 42. The closeness of the northern sites that are parallel to the drive make backing into a site difficult. My site was level and paved with plenty of room. People drive too fast on the main road into the campground for the safety of little kids. The playground was very nice. We didn't use the pool but it looked nice. The fire rigs were very nice with a built in grill. Camp store / nature center was very close by. We camped at Mohican State Park in a Travel Trailer. Typical of a state park with grassy and dirt sites, fairly level. Surprisingly quiet for a holiday week and fairly full. We only did an overnight while passing through. It was quite a distance off interstate so not convenient for one night. Staff was extra nice. We camped at Mohican State Park in a Motorhome. We stay here when visiting Holmes County. Didn't have reservations, but found a site for 3 nights. Not the best, but not the worst either. If it had rained, the site would have been under water. Did some bike riding around park, but generally just relaxed. The park was BUSY and I think full to capacity all nights. Friendly staff, the RR were cleaned at least twice daily. Tubing was in full swing even though it was unseasonably cool. Very family oriented, but was quiet after sundown. We enjoy camping at this SP. We camped at Mohican State Park in a Tent Trailer. 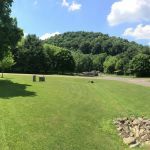 Holmes County, Loudenville, Mohican SP Lodge, Hiking, biking, fishing, tubing, relaxing. Very clean, and we came at the right time of the year when the leaves were at their peak color. During the time we were there, they kept the grass mowed without being intrusive. We had a slight problem with our motorhome. We walked up to the office to say that we would not be able to leave before check out time. They were very understanding and even gave us a phone number to call to get some help. Will definitely be going back. We camped at Mohican State Park in a Motorhome. We purposely didn't bring a tow vehicle so that we would stay in one spot and just relax. However, we are from the area and know that the Amish Country is near and a great way to spend the day. Also, the park itself has a beautiful covered bridge and the surrounding area is like a Norman Rockwell picture. Very narrow asphalt sites with grass between each one. Outdated water and sewer connections. A wooden wedge was required to keep the spring loaded water valve open. Laundry room was not clean. Appliances were old and rusty but the price to laundry was very reasonable. The location was beautiful. Campground had a playground and a pool. Satelite reception was spotty. We camped at Mohican State Park in a Fifth Wheel. Park is near Amish communities in Berlin and Millersburg which offered interesting things to do and see. There is a huge hardware store in Charm, OH which was a highlight for some as was visiting Lehman's in Kidron, OH. This park is one of the most family friendly state parks. The pool, splash pad and play ground are top notch. Its hard to get sites at this campground in the summer and quickly sells out 6 months in advance. The ice cream shop is also a must stop. We camped at Mohican State Park in a Motorhome. Downtown Loudonville has some nice little shops and restaurants to visit. A drive through the state park is a must to see the covered bridge and the gorge overlook. Breathtaking scenery and a beautiful drive, winding through the forest. Highly recommend this area. The Park is in Amish country and the charming little town of Loudonville nearby sells Amish made furniture. There is hiking and a playground in the park. Canoe rentals are nearby too. Malabar Farms State Park is 8 miles away and does tours. Very popular park, book early. Close to the Amish towns. Are you affiliated with Mohican State Park ?